The Metro pays tribute to the "heroes" who saved Notre-Dame and its treasures. 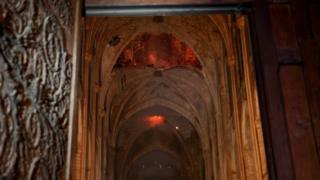 They praise the Paris firefighters who fought the flames inside the building and the cathedral's chaplain, Father Jean-Mark Fournier, who "begged for consent to join crews" inside Notre-Dame and retrieve its most precious artefacts. The same Catholic priest entered Paris's Bataclan theatre in 2015 to give the last rites to victims of the terrorist attack there, according to the paper. The i newspaper highlights fears that the Palace of Westminster is vulnerable to fire. An editorial in the Sun says MPs and peers should consider the disaster at Notre-Dame a "wake up call" and they should resist the urge to "delay a much-needed restoration for years". "The idea of Parliament burning long into the night is one we don't want to contemplate," it warns. "Criminals to be handed a clean slate" says the Daily Telegraph as it reveals that Home Secretary Sajid Javid wants to end the automatic disclosure of minor convictions to prospective employers. Mr Javid says he believes juvenile offenders should not be denied jobs. But some campaigners warn changing the rules could leave employers in the dark about potential risks. In its coverage of climate change protests in central London, the Daily Telegraph suggests the Metropolitan Police has run out of cells to hold the more than 200 activists who have been arrested. The Guardian asks the protesters to explain their motivation. It speaks to a student from Bristol who is "freaking out about the climate" and a 15-year-old schoolboy who describes the need "to do something drastic", but knows his parents are "going to be mad" if he ends up being fined. One officer complains cell capacity has "probably halved" in the past few years and says the issue is hindering their ability to "stop the disruptive antics". As campaigners threaten to disrupt the London Underground, the Daily Mail asks: "So who are the eco protesters holding the capital to ransom?" Among them are a 54-year-old care worker from Stroud who, it says, "previously lived in the Dordogne in a luxurious home with a pool" and a 47-year-old biophysicist who is said to have become "an activist as a result of taking psychedelic drugs". Details of this year's BBC Proms are revealed in some of the papers. The Times announces a selection of songs by Prince Albert - including a serenade to Queen Victoria - has been given a top slot at the Royal Albert Hall. The repertoire will be played on a 160-year-old piano that will leave Buckingham Palace for the first time, to celebrate the 200th anniversary of Victoria's birth. The Proms director, David Pickard, says the works "are not hugely sophisticated, but they are very nicely crafted". The Guardian says Mr Pickard is considering a prom of mindful music performed completely in the dark, which would offer the chance for meditation and contemplation. With official figures showing that one in 10 over-65s is still holding down a job, the Daily Express believes it may have found "Britain's hardest-working family". The six siblings from Barnsley "have a combined age of 475 years but still work up to seven days a week". The eldest is 90 and is thought to be Britain's oldest greengrocer. All six siblings, the paper says, insist anyone who mentions the word retirement should "stop swearing". The Washington Post leads with Donald Trump's second veto of his presidency - against a resolution that would have ended US support for the Saudi-led military campaign in Yemen. It says Mr Trump "viewed the Yemen vote as a rebuke of his administration after the killing of the Saudi journalist Jamal Khashoggi and urged some senators not to go along with it". The New York Times says "several of the president's top advisers, including the Secretary of State Mike Pompeo and the national security adviser, John R Bolton" opposed the legislation, which had been passed by both houses of Congress.